The NHA needed another club because its players were enlisting to fight overseas. With the 228th added in, stars like George McNamara, Gordon “Duke” Keats, Goldie Prodgers and Art Duncan could now be kept in the NHA playing hockey (and making money for NHA owners), while training for overseas duty. Dressed in their khaki sweaters, the Fusiliers defeated an NHA all-star team 10-0 in December 1916. By the New Year they were in first place. 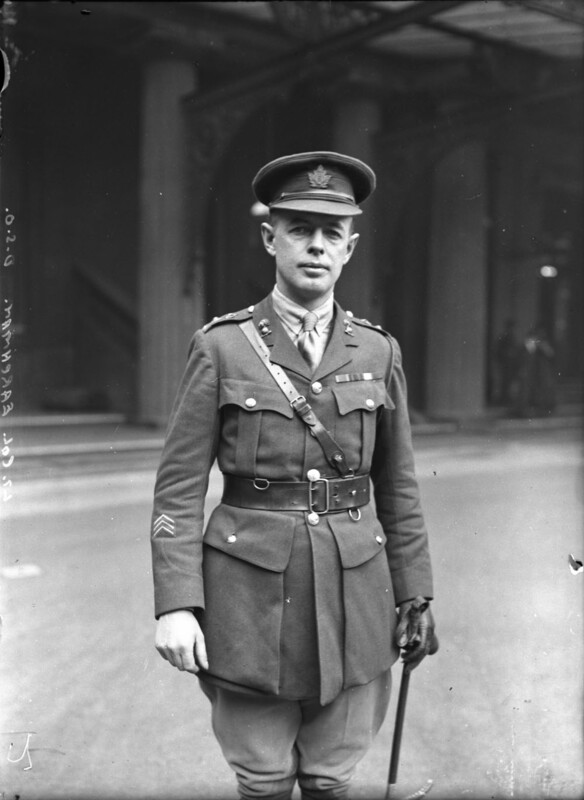 However, by then fellow Canadian soldiers were fully engaged in Europe and there was talk of conscription. An uncomfortable question was in the air: Why were soldiers making money playing hockey when men were dying overseas? The official line was that profits made by the 228th were going into the regimental fund; but the criticism seems to have led to the battalion being suddenly ordered to ship out in February—before the NHA season was even over! It also turned out the battalion had not paid many of its bills, and some suggested bringing Earchman back to Canada to face a court martial. This entry was posted in Exhibitions, Military Heritage and tagged 228th Battalion, First World War, hockey, Sports by Library and Archives Canada Blog. Bookmark the permalink.